In March 2012, the American Red Cross (ARC) unveiled its new social media “Digital Operations Center” (DOC) as the “first social media-based operation devoted to humanitarian relief”. Among other things, the ARC DOC is designed to monitor social media during disasters and support disaster response efforts with resource management and rumor control. Unfortunately, for those unfamil- iar with social media, the previous two sentences don’t mean much. For many in the emergency management field, social media is still a mystery without a clear definition or easy-to-follow steps for using it. This article is a quick reference guide for those who want to become more familiar about #SMEM. Social media is a broad term that includes various technologies, services, brands, and communica- tion methods via the internet that are interactive in nature. “Social” refers to the interactive nature of the communication, while “media” refers to multimedia devices and communication methods rather than formal, news media. Services like Twitter, Facebook, Google +, Pinterest, and various document, video, and audio sharing sites and blogs are all considered social media. While some services allow public sharing, most require users to have an account (almost always at no cost). 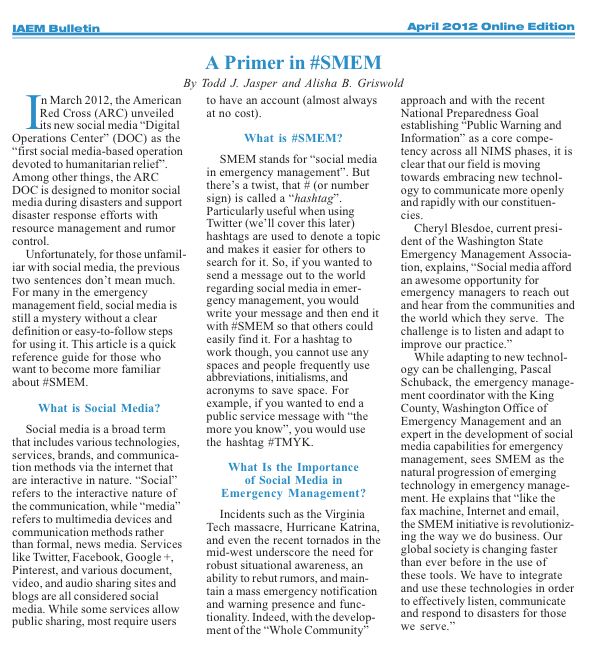 SMEM stands for “social media in emergency management”. But there’s a twist, that # (or number sign) is called a “hashtag”. Particularly useful when using Twitter (we’ll cover this later) hashtags are used to denote a topic and makes it easier for others to search for it. So, if you wanted to send a message out to the world regarding social media in emer- gency management, you would write your message and then end it with #SMEM so that others could easily find it. For a hashtag to work though, you cannot use any spaces and people frequently use abbreviations, initialisms, and acronyms to save space. For example, if you wanted to end a public service message with “the more you know”, you would use the hashtag #TMYK. What Is the Importance of Social Media in Emergency Management? Incidents such as the Virginia Tech massacre, Hurricane Katrina, and even the recent tornados in the mid-west underscore the need for robust situational awareness, an ability to rebut rumors, and main- tain a mass emergency notification and warning presence and functionality. Indeed, with the develop- ment of the “Whole Community” approach and with the recent National Preparedness Goal establishing “Public Warning and Information” as a core competency across all NIMS phases, it is clear that our field is moving towards embracing new technology to communicate more openly and rapidly with our constituencies.